The Jacksonville Jaguars announced their record-breaking project during the 2013 offseason: a $63 million upgrade that called for the largest end-zone videoboards in the NFL, more total video square footage than in any stadium in the league, and a completely revamped video control room to handle it all. The videoboards, manufactured and installed by Daktronics, feature a 13HD-pixel layout and, combined, more than 21,700 sq. ft. of digital canvas. They also presented the first hurdle for the Jaguars’ event operations team. To build the 8K Control Room to dive the videoboards took venue consultant WJHW and systems integrator Alpha Video Sports & Entertainment. The Jaguars gutted their SD control room to build a state-of-the-art room that could handle 8K. 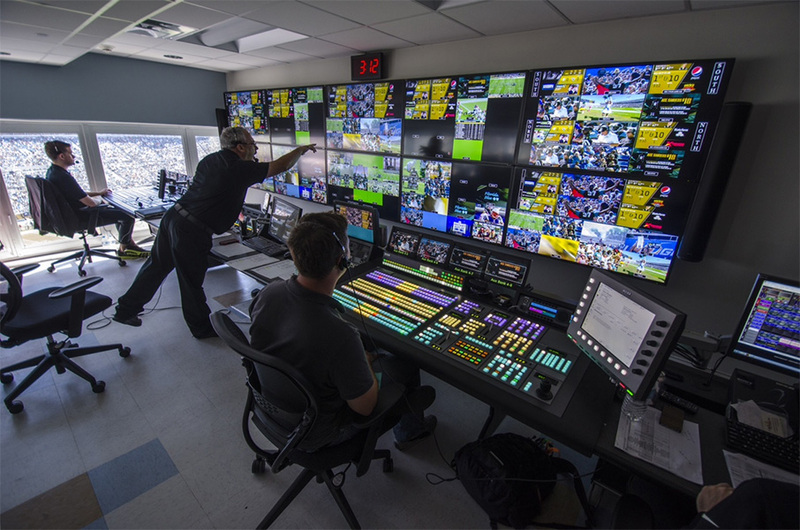 Located on the sixth floor in the northwest corner of EverBank Field, the video-control room features an Evertz router, multiviewer, main frames, frame syncs, and software. For replay, the Jaguars opted for three eight-channel Abekas Mira instant-replay servers, giving the team a total of 18 channels of record and six channels of playout, as well as an eight-channel Mira production server. Graphics are supported by a number of sources. The Jaguars selected four two-channel Ross XPression Studio graphics engines (as well as Ross Inception social-media management), ChyronHego 1st-down-and-distance virtual-graphics system, and a two-channel Click Effects CrossFire system. To manage fiber connectivity to edit stations and the massive file size of 8K video content, the Jaguars invested in an EditShare platform.